and that pretty much sums it up. 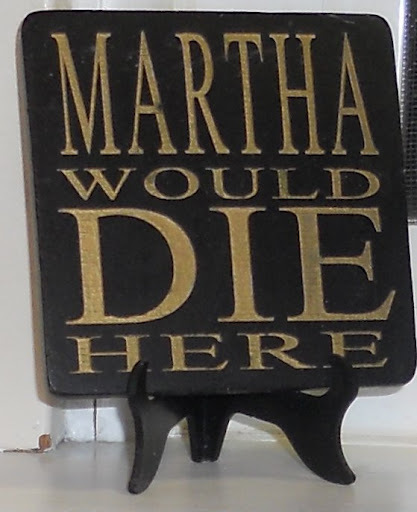 Martha I am NOT. Well, not in terms of getting up at 5 AM to bake muffins made with blueberries from my back garden and wheat I ground in my mill and butter I churned from my own cow and eggs from chickens that scratch at my back door. Because I don’t grow my own blueberries, of course. That’s hard work. In many other ways I am just like her. Oh yeah, you know you want one. I didn’t buy it like this, I bought it new. It came into the house and I immediately put it into the sun room because it was so clean and NEW and I envisioned myself sitting on it in the sun and reading while the kids napped. In reality, it just languished in the sun room all alone. Meanwhile, about 10 years passed while the kids puked and colored and drooled on the other new furniture (actually, I think they were sucking on it. Don’t judge me; they’re boys you know) . We finally listed the old couch on Craigslist and found some poor suckers people to take it, adopted my in-laws’ couch when they moved out of the country, moved a second armchair to the basement, and the beautiful yellow chair came back into daily use. Almost immediately the seat shredded. We blamed it on years of overexposure to the sun, not unlike a tanning bed. Am I right? Then the kids started drooling/sucking on the arms (remember, we’re not judging). I tried to clean it up with spot remover but that just left more spots. Of COURSE we didn’t sit on it like that. Don’t be silly. We covered it with an equally ugly throw. 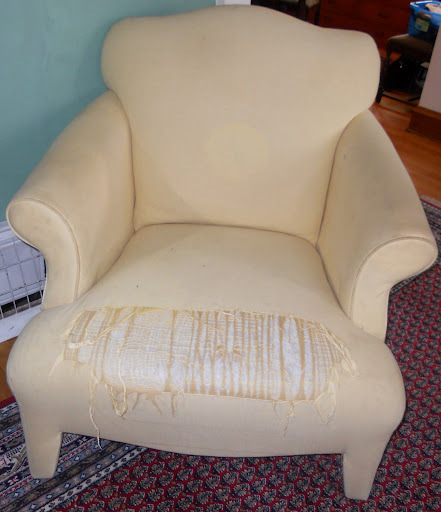 Unfortunately, the throw didn’t cover this side of the chair. I would vacuum that thing within an inch of its miserable life with limited success. It was awful, plain and simple. Once we decided we could afford to replace it, we looked and looked for one we liked better. Don’t get me wrong, the yellow monster was UGLY but it was also very comfortable. 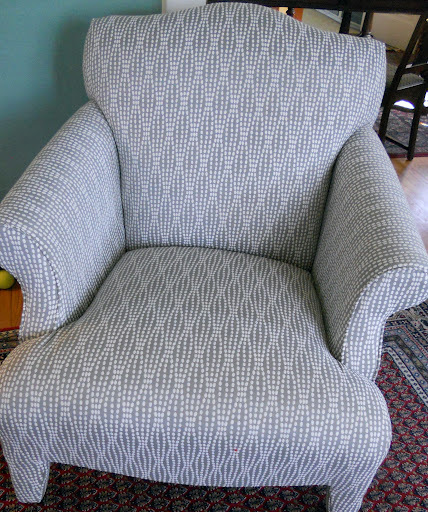 The legs were sturdy, the back was just the right height and it had one other very important criteria that I didn’t even know my husband required: it was not overstuffed. We must have shopped for 4 months for a new chair, each time coming home empty-handed. New chairs had become really expensive in the 12 years we weren’t looking for one, yet they were cheap if you know what I mean. Not only were they pricey, they were too big, too overstuffed, and simply not quite right. 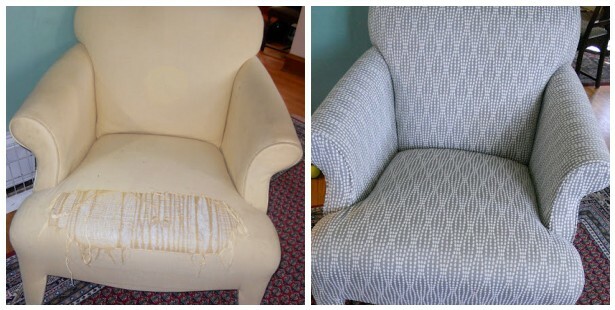 I finally broached the subject of re-upholstering the yellow monster. I fully thought my husband would object. So we went shopping for fabric and he picked out A LOT of fabric I didn’t like. 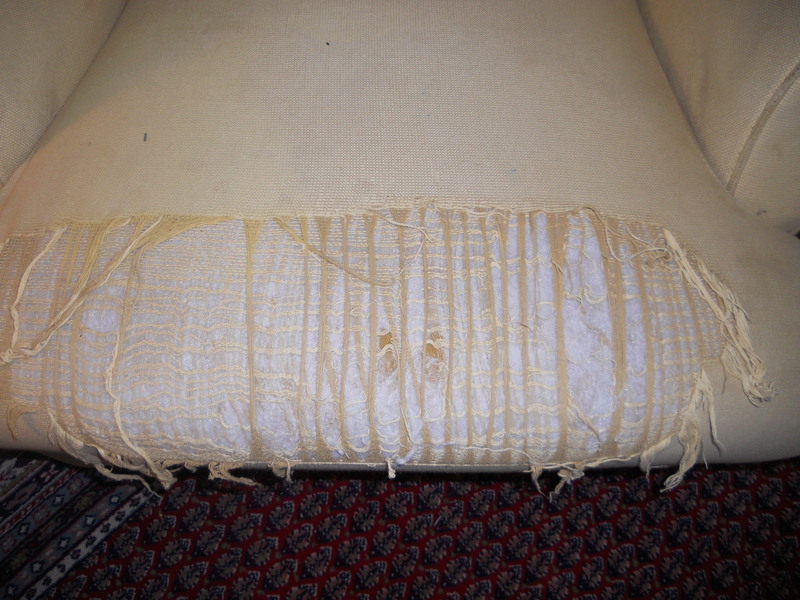 I had no idea we were upholsterally incompatible. Finally he said I should just choose something, as long as it wasn’t gray, and take care of it. No more spots, or drool, or dog hair. 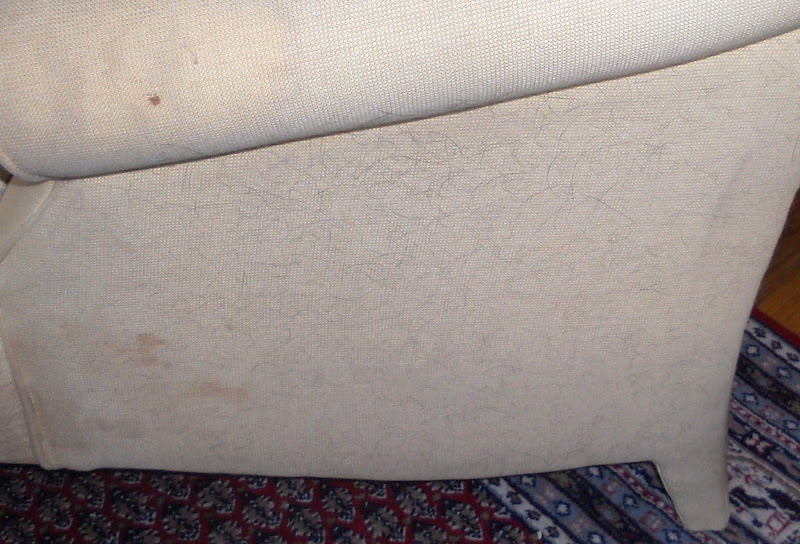 Coming soon: the in-laws’ couch.